The Institute for Supply Management’s index of manufacturing activity shot up to 57.3, its highest reading in more than two years and the sixth straight month of increases. Any reading above 50 suggests an expansion of manufacturing activity, and Monday morning’s number beat economists’ expectations of 55, suggesting that the manufacturing economy has more spring in its step than many had thought. Even more encouraging for the U.S. economy was a report from the Census Bureau showing that construction spending in October rose to an annualized rate of $908.4 billion, 0.8 percent above September’s level and 5.3 percent higher than October 2012. These increases suggest that the sharp spikes in housing prices over the past 18 months are finally leading home builders to ramp constructing the hiring that goes along with it. 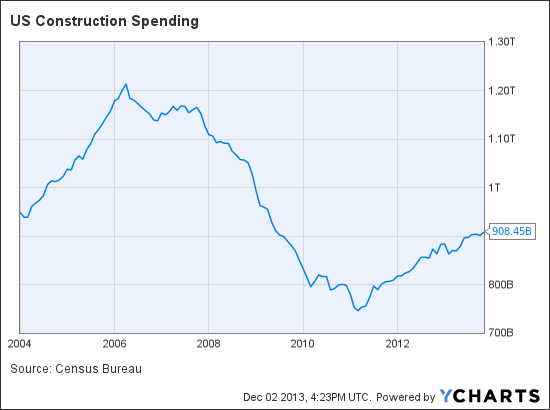 As the chart below shows, the economy still has a long way to go before construction spending once again achieves its pre-crisis highs, but the trend bodes well for the economy going forward. Growth in construction spending is particularly important because the construction sector is one that normally provides relatively good paying jobs for lesser-skilled workers who have had a particular tough time finding employment following the financial crisis. According to a new report from Tom Teles, an analyst with Goldman Sachs Asset Management, “the US housing recovery to date has primarily been a story of increases in the price of homes and related assets,” rather than of aggressive building and hiring by U.S. home builders. But Monday’s numbers bolster the case that higher home prices might finally be translating into a stronger economy. Teles estimates that higher prices will finally motivate serious hiring to the tune of 300,000 to 500,000 new jobs per year. “Multiplier effects in other housing-related industries could create a similar number of jobs, doubling the overall impact on job growth,” he writes. The Bureau of Labor Statistics will release its estimate for November job gains on Friday, providing a clearer picture of the construction and manufacturing sectors effect on employment.